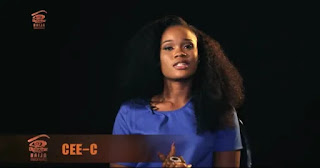 Controversial Big Brother Naija housemate, Cee-c, has revealed why she constantly fights and talks in her sleep. Nina, Lolu and Miracle had discussed they saw Cee-c having a long conversation, and fighting in her sleep. Cee-c who has been in loggerheads with several housemates in the house, however, explained to Nina that her conversations in her sleep happens sub-consciously not that she's possessed. She said her mother took her for prayers for her sleep issues. She said , ‘It’s because of the issues I’m having. It’s something that happens sub-consiously. A continuation of whatever happens during the day or week. ”My mum actually took me to church for prayers in the past. So I was told to stop playing too much. It’s not spiritual .